Though not necessarily as widely known as their NewSpace counterparts, Moon Express showed that its plans to upend exploration beyond Earth are no less impressive than those of its peers. On July 12, 2017, the Florida-based company announced ideas for a trio of missions to the Moon, the first of which is tentatively scheduled for late in 2017 – potentially making them the first commercial company to reach Earth’s natural satellite. As one of the teams competing for the Google Lunar X Prize (GLXP), Moon Express set itself up from the beginning to challenge for a prize totaling $30 million, by launching a robotic explorer to the Moon. To achieve this, the company must land on the surface, travel at least 500 meters (1,640 feet), and transmit high-definition video and photos back to Earth. Although the company is comparatively young, having been founded in August 2010, Moon Express has wasted little time in advancing its goal of opening up lunar and deep space exploration to commercial interests. Indeed, within a year of its founding, the fledgling company successfully completed a test flight of the Lunar Test Vehicle (LTV), a prototype lunar lander that was developed in partnership with NASA. The company continued to rack up an impressive list of accomplishments in the following years, including becoming the first commercial company to develop and successfully conduct flight tests of its own lunar lander. These successes kept Moon Express in the hunt for the GLXP, being one of five teams still vying for the award, as well as earning itself a partnership with NASA on the Lunar Cargo Transportation and Landing by Soft Touchdown (Lunar CATALYST) program. The company secured a launch contract with Rocket Lab in December 2015, and, in July 2016, it became the first company to win government approval to send a payload beyond low-Earth orbit (LEO). The vehicle Moon Express has tapped to lead their first lunar mission is MX-1 single-stage spacecraft and lander. Capable of delivering up to 30 kilograms (66 pounds) to the lunar surface from LEO, the MX-1 somewhat resembles R2-D2 from Star Wars. The lander uses Moon Express’ own PECO propulsion system, which makes use of high-test hydrogen peroxide as its propellant, providing approximately 5.8 km/s of delta-V (amount of velocity change the spacecraft has). This level of delta-v is sufficient for the vehicle to travel from LEO, land on the lunar surface, lift-off, and travel the requisite distance, and land again to satisfy the guidelines of the GLXP. While the company aims to launch by the end of 2017 so that it has a shot of claiming the GLXP, Moon Express has greater ambitions than simply winning the purse. “That’s where my heart is – Solar System exploration on a grand scale that democratizes and completely accelerates our evolution into the Solar System through knowledge and discovery, not just a few expensive voyages sponsored by kings and governments, like in history,” Moon Express CEO and co-founder Bob Richards was quoted as saying in an article on Space.com. 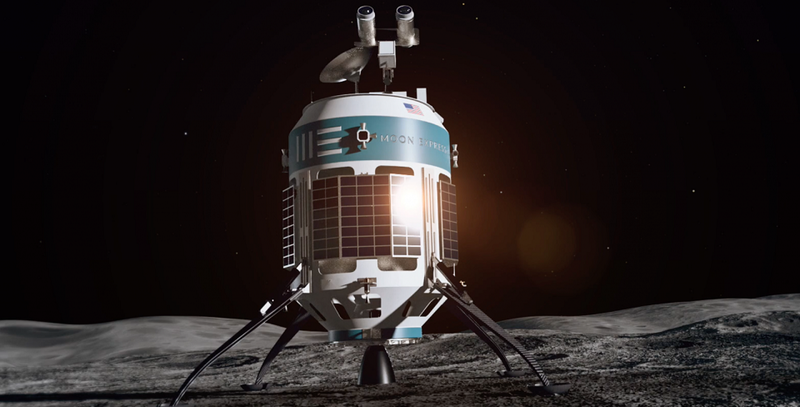 After the initial mission, termed “Lunar Scout” by the company, Moon Express plans to undertake two successive missions, each more ambitious than the last. The company’s second mission, which Moon Express has termed “Lunar Outpost”, will land near the lunar South Pole, and will utilize the company’s larger MX-2 spacecraft. Essentially two MX-1 vehicles in a tandem arrangement, the larger MX-2 allows for a greater range of missions to a larger number of destinations. From its position high on a lunar peak bathed in perpetual sunlight, the MX-2 will seek out water ice trapped in the regolith of craters shaded in terminal darkness. Water can be used to manufacture rocket propellant when broken down into its hydrogen and oxygen components, or it can be used to generate breathable oxygen or drinking water, which will be a need for human habitation beyond Earth’s surface. Lastly, the company plans to launch its “Harvest Moon” mission by 2020. Designed around the MX-9 spacecraft, “Harvest Moon” will land on the lunar surface, collect samples, and launch them back to Earth for recovery. Moon Express considers this to be the beginning of their business phase of lunar prospecting. As its name suggests, the MX-9 consists of nine MX-1 cores and can deliver up to 500 kilograms (1,102 pounds) of payload to the lunar surface from geosynchronous transfer orbit (GTO). Also in the family is the five-core MX-5. Like its MX-9 cousin, it can be configured for orbiter, lander, and deep space operations, and is capable of sample return missions. With such a diverse collection of vehicles, with a broad range of capabilities, it’s apparent that the company has ultimately set its sights beyond Earth’s nearest neighbor.